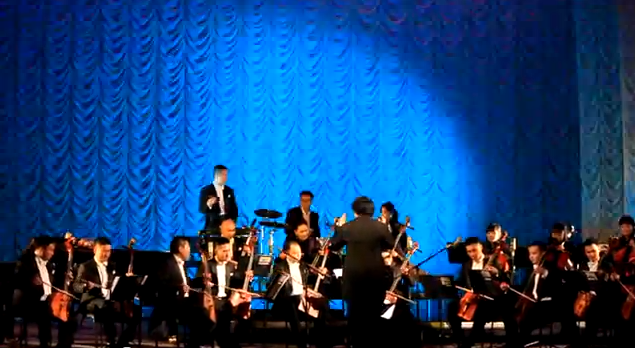 The State Morin Khuur Ensemble is one of Mongolia’s more famous musical exports. Founded in 1992, the group features up to 30 musicians, most of whom play Mongolia’s traditional instrument, the morin khuur or horse-head fiddle – a two-stringed instrument held like a cello and played with a bow made of horse hair. The ensemble has performed traditional Mongolian tunes as well as adaptations of Western classical and popular music around the world. Last Friday, I had an opportunity to hear the group perform at the National Academic Theatre of Opera and Ballet of Mongolia (one of the few major theaters in Ulaanbaatar). This particular performance was titled “Novel Melody”, a program featuring music from Argentine composer Astor Piazzolla, Dave Brubeck, George Gershwin, and, yes, Michael Jackson. I had been looking forward to this performance all week, not knowing what the ensemble was actually planning on playing. So, you might imagine my excitement as I scanned the program before the performance began. Astor Piazzolla – sounds interesting. Louis Armstrong – lovely. Dave Brubeck – I’m curious. George Gershwin – love him. Michael Jackson Medley – WHA?! And the ensemble did not disappoint. The group (made of 13 morin khhur players, 3 dund khuur (cello) players, 2 ikh khuur (bass) players, 1 yatga (zither) player, 1 pianist, 1 percussionist, and 2 guest vocalists) performed elegantly and easily adapted the various artists’ tunes to their instruments. Two morin khuur players even took jazz solos during Dave Brubeck’s “Take Five”. Honestly, if they had stopped short of the Michael Jackson I would have been content. But that doesn’t mean I didn’t squirm in my seat with anticipation as they played those long, unmistakable notes at the beginning of “Thriller”. I was euphoric. They even featured the zither during “Billie Jean”. My only complaint was that it ended too soon. After a boisterous round of applause and call for encores, it became clear that they would, indeed, give us a little more. I turned to my friends and said, “I just want them to play Michael Jackson again.” And that is exactly what they did. Two Michael Jackson medleys (or rather, one Michael Jackson medley played twice) in one night. Unbelievable. I love what you’re doing! I’d love to help you anyway I can. Can we chat sometime?